When those of you who were away return this August, you will notice a number of changes to the campus. Most notably, excavation and construction have begun for the new residence halls located between the COOP, Andrews Hall, and Stillman Hall. The work included the removal of a significant number of trees. While we have known this was coming, it is still a dramatic change to see firsthand, and it reminds us of our roles as stewards of this campus. 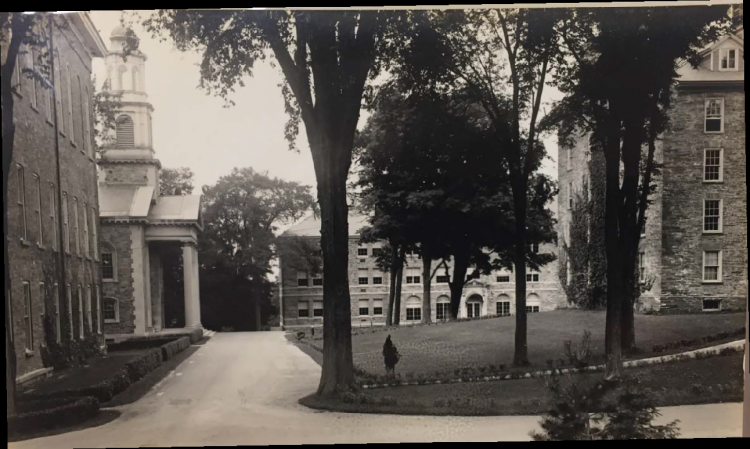 It is our responsibility to ensure that, as the campus evolves to meet the need for new classroom space, residence halls, or other campus needs, we also strengthen and preserve the overall experience of the landscape for future generations of Colgate students, staff, and faculty. The Colgate community shares a deep and abiding connection to this campus, developing a strong sense of place in large part because of its profound beauty. The confluence of the sloping green hillside with the stately stone buildings makes for a striking intersection of the natural and built environments. While difficult to articulate, our sense of place is firmly rooted at that intersection. As a major step toward sustaining and strengthening the natural and built environments, we have begun preparation of what we are calling the Upper Campus Landscape Master Plan. This plan will help guide the future of Colgate’s historic core, both by establishing guiding principles by which future landscaping and infrastructure decisions can be made, and by outlining a series of planting projects that will restore and renew the landscape. 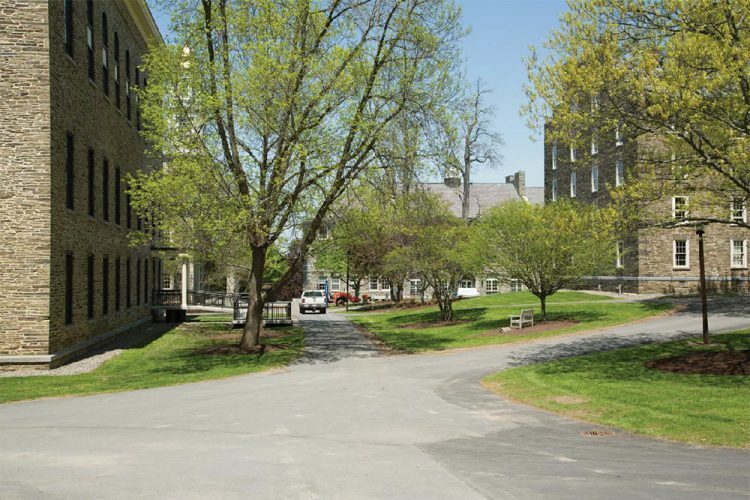 The Upper Campus Landscape Master Plan is all about preserving the campus environment that defines Colgate not only for current students, staff and faculty, but also for the alumni that continue to carry this place with them years after they are gone. 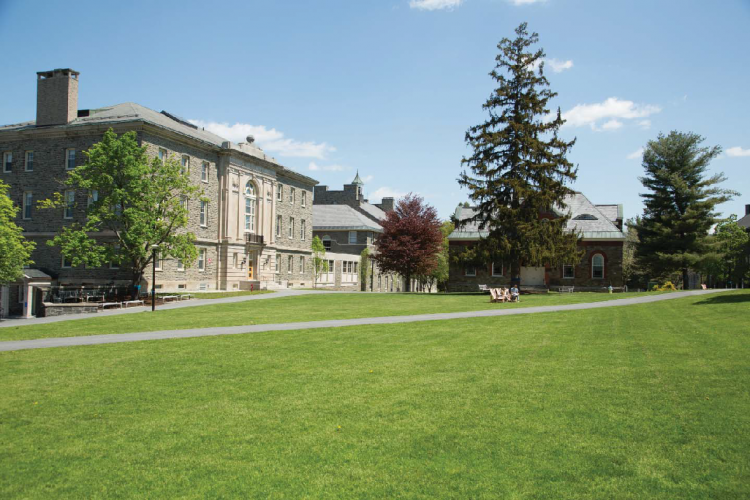 As part of our stewardship, we also want to think about how the Colgate campus landscape performs as an ecological system, including its impacts on the larger environment and its capacity to become more self-sustaining. We are managing the environmental impact of the extensive, but temporary, disturbances where the new residence halls are being built, and, at the same time, we are undertaking a review of campuswide landscape practices with the intention of improving sustainability and resilience. To oversee this process, Colgate has hired Michael Van Valkenburgh Associates (MVVA), an internationally regarded landscape architecture firm based in Brooklyn, N.Y. The firm has extensive experience working on historic campuses and has engaged in a number of important campus landscape projects around the nation, including the restoration of Harvard Yard and its ongoing upkeep, the renewal of Wellesley College’s campus, and the oversight of all projects on the Princeton University campus and at Vassar College. 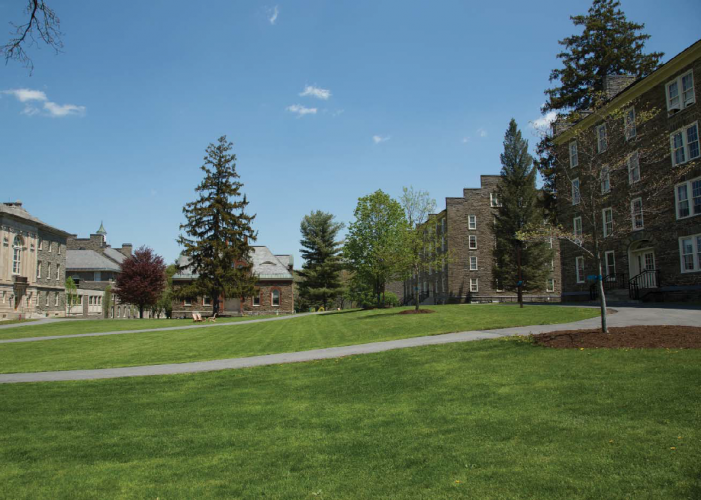 There will be multiple opportunities this fall for the entire Colgate community to be part of formulating the Upper Campus Landscape Master Plan, beginning with public meetings that will be held in the early fall. At these meetings, MVVA will discuss a range of issues that will affect the long-term future of the campus landscape and seek input from community members. The University Property Committee will lead this campus engagement. We very much look forward to having you join this conversation and hearing what you have to say. In addition to developing the Upper Campus Landscape Master Plan, we are excited to share with you a more immediate initiative to restore the upper campus tree canopy. 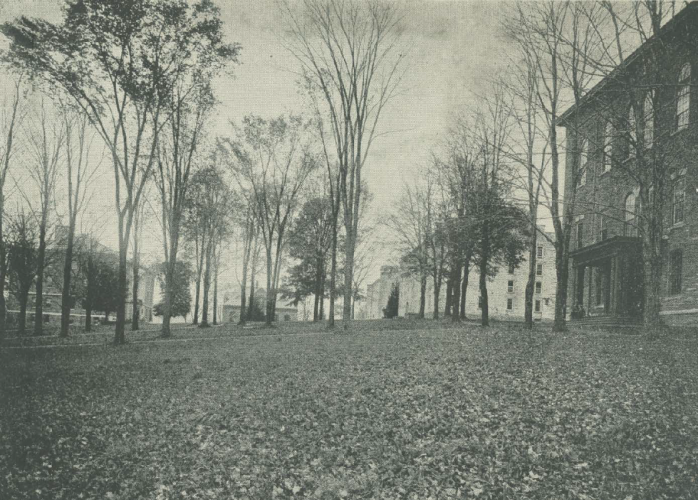 The Academic Quad has long been one of the most important and iconic spaces on Colgate’s campus. However, in the attached photographs, you can see that it has experienced significant change over the years. With the arrival of Dutch elm disease in North America in the late 1920s, many of the stately American elms that comprised the upper campus tree canopy were decimated, and today’s quad, much as we love it, is a pale reflection of its former glory. Many other remaining trees on campus are reaching the ends of their lifespans, and others, such as the American ash, are now threatened by new pests and diseases. 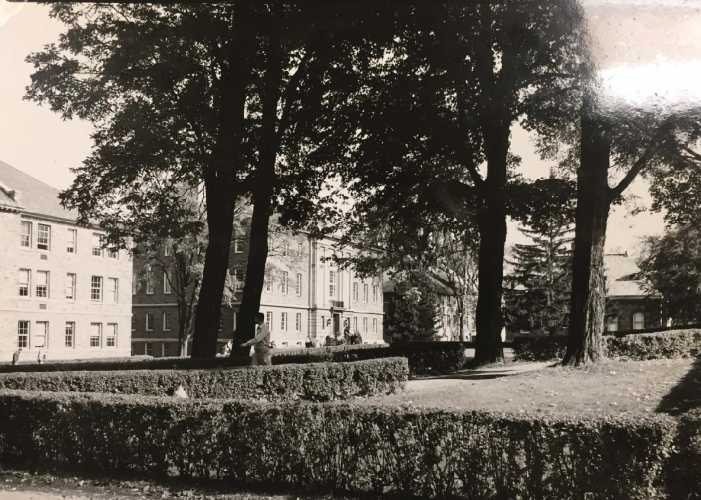 In order to address the current threats to the existing trees in the quad, to restore the character it once had, and as a tribute to the university’s impending bicentennial, we will be planting two hundred mature trees in and around the historic core of the campus in time for Colgate’s bicentennial anniversary. Plantings will begin in the spring semester of 2018. We are excited to begin this important work and look forward to discussions about our campus landscape and the elements of our environment that define our sense of place.